I love the excitement of car racing, but I’m also afraid of the dangerous nature. There is a place in Hong Kong where offers a virtual racing experience, which is completely safe, and everyone qualifies to be a racer. Here you don’t even have to care about DUI (driving under the influence) as you can even drive with one hand while the other hand holding a bottle of beer. A colleague of mine even talks on the mobile phone while driving and drinking! Wonderful multi-tasking skills! My company had a team building event yesterday, and took us to the Sideways Driving Club where we all had great fun. They have several English speaking young guys providing all-round assistance including catering, coaching and game administering. We were offered to race on a BMW Mini simulating driving at a track in Germany. Some of the young guys gave hands-on assistance to those in need. Although it was virtual, it was indeed quite exciting, and each of us had a driving turn of around 45 minutes. After all, we all found very tired, just like having had a real race. The place is relatively compact. There are only 15 driving simulators. The bar area is in the middle of the shop. We can only collect the food and eat while standing. Atop of Lan Kwai Fong, it is easy for us to look for other entertainments after the race. The place operates daily between 12:00pm to 11:00pm. You can choose from one of the following packages or even join a membership. The minimum cost will be HK$300 for one-hour driving only. I personally would suggest driving only or driving & drinks. Because there is no kitchen, the food was ordered from 3rd party and were no more fresh and hot when arriving. 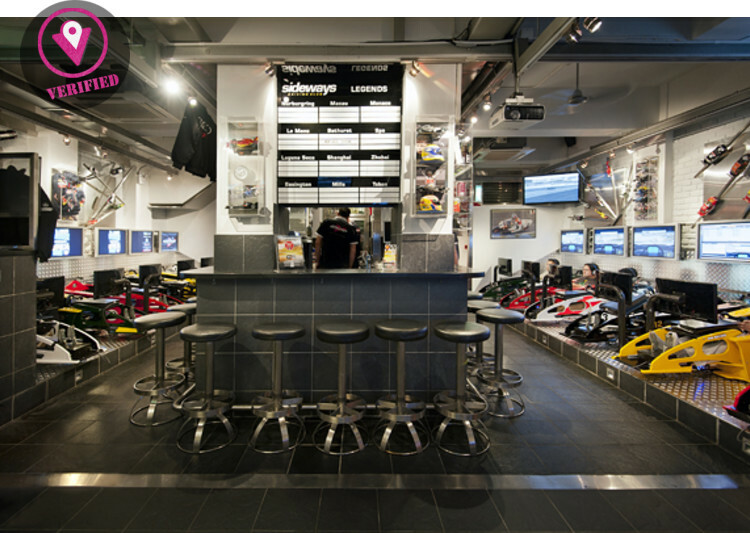 The Driving Club also has a racing gear shop. 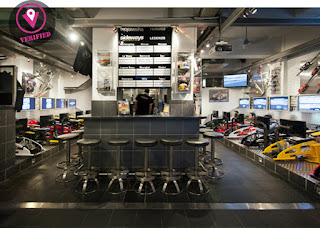 You can buy all kinds of racing related gadgets here. We always talk about multi-tasking in the work place. But it does not stop there. You can find people multi-tasking everywhere in Hong Kong, and most of these scenarios are having mobile phones involved. Indeed, mobile phone has become an important part of the lives of many or even most people in Hong Kong. Look at the photo below, is he busy enough? Nope, not at all. Let me tell you two of the real scenes that I saw recently. At the office building where I work, I saw a lady in front of me, bending her body which made her posture a bit odd and that caught my attention. When we went into the same lift, I realized she was actually multi-tasking. She has a moderately big bag hanging on her shoulder, holding an A4 size leather folder between her arm and body. She was talking on the mobile phone (without headset), and at the same time holding 2 cups of coffee (without any carrying bag). She did all these simultaneously while pressing the button in the lift to go where she wanted to go. Is she busy enough? I can hardly imagine where she came from, whether she bought the two cups of coffee before or after answering the mobile phone, either way, it was indeed challenging. This second scenario is even more demanding. On a rainy day, I was waiting for a tram at a tram stop and saw a man trying to get onboard a tram. He had to close his umbrella, of course, while he went onto the tram. At this same moment, he was holding a suitcase and talking on the mobile phone (without headset). I don't know how someone with two hands can manage that many tasks at the same time, but it did happen. Of course the most unfortunate people were those who tried to get onboard the same tram. I was afraid to get even wetter, so I chose to wait for the next tram. After all, the other mobile phone multi-tasking seems to be nothing, such as I saw a man swimming and smoking while talking on the mobile phone. My boss once told me he saw a man at the airport smoking, running with a trolley and at the same time speaking on the mobile phone. Well, what else will you do with mobile phones? 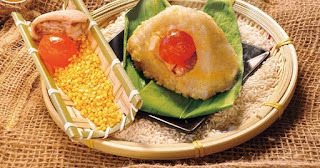 Today is Dragon Boat Festival, Chinese society generally have a day off. In Hong Kong, it's a public holiday; while in China, the holiday spans through June 19 to 22. Let's talk about some interesting facts about the festival. 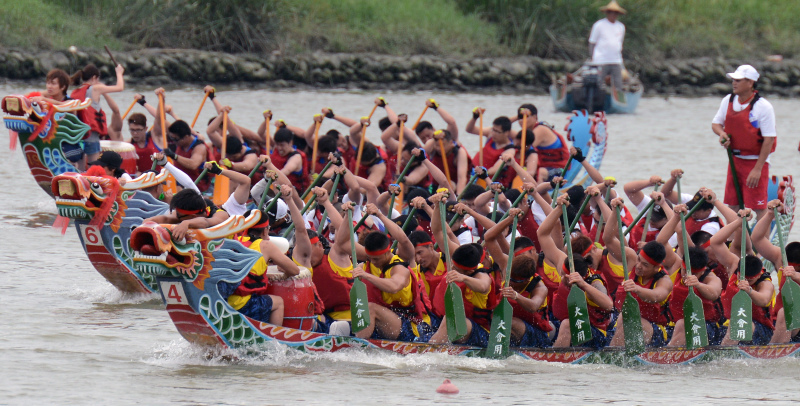 Dragon Boat Racing is an important event in Hong Kong, domestically and internationally. Every year, there are races being held, gathering local and internal rowers to create great gesture and fun. South China Morning Post has shortlisted seven best places to view Dragon Boat Races in Hong Kong. Click on the link below for more information. In memory of Patriot Qu Yuan of Chu during the Warring States periods in China. The little video presents the original of the festival along with some of it's associated activities and foods. 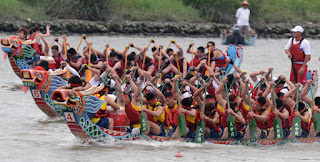 As Dragon Boat Racing is such an important event among Chinese society, their is a famous music written for the activity. Here it is played by Chinese Orchestra. Click on it, enjoy the lovely music while having a sense of the races. Of course dumplings are the most important. Dumplings seem to be the only festival food being ate through out the year especially in Hong Kong. There are many types, shapes and tastes. But they are all wrapped by bamboo leaves and being steamed for a few hours. Originally was meant to be thrown into the river so that fishes eat the dumplings rather than the body of Qu Yuan. Egg yolk is an important ingredient for savory ones. For luxury ones, people may add pork, mushroom and many other ingredients that they like. 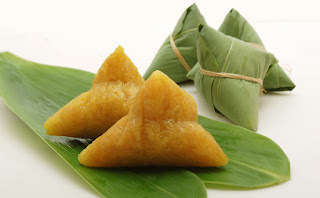 As for the sweet ones, there is always lotus paste inside. It was the Mid Autumn Festival (August 15th in Chinese Calendar) yesterday, one of the most important festivals in Chinese culture. 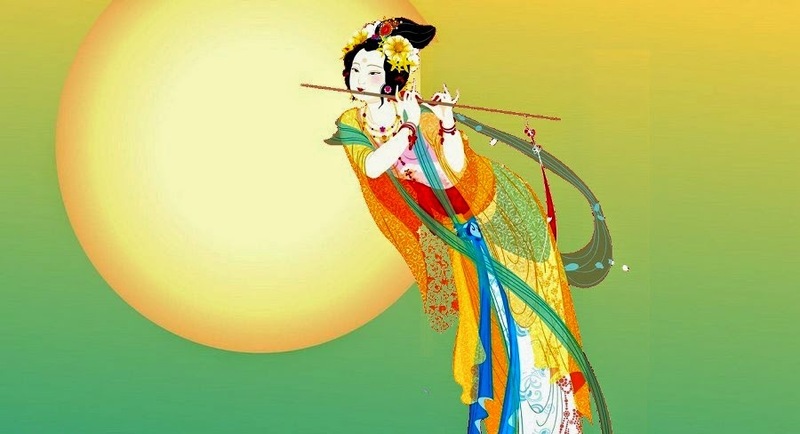 In tradition, Chinese celebrate the festival in three phases - Welcoming the Moon (August 14th), Admiring the Moon (August 15th) and Chasing the Moon (August 16th). In Hong Kong, the public holiday falls on the Moon Chasing day. It used to be on the Festival day, ie. 15th, but somehow the former colonial government said people admire the moon at night, they can still work in the day. However people sleep late after admiring the moon, the following day became a holiday. And this has been practicing after the handover through now. 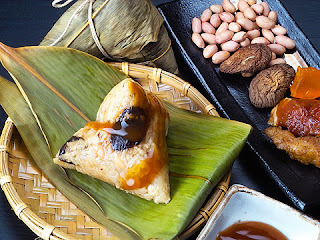 The Mid Autumn Festival is all about the moon, moon cake, lanterns and many other celebrations. Let's talk about all these in Hong Kong. The Moon - Although the moon looks the same anywhere in the world, but this was the one I took after dinner last night. And I had a second chance of admiring her while on bed - she was shining on my bed through the window. Exactly what Li Bai said - 床前明月光. It was a bit of luck, because admiring the moon all depends on weather. 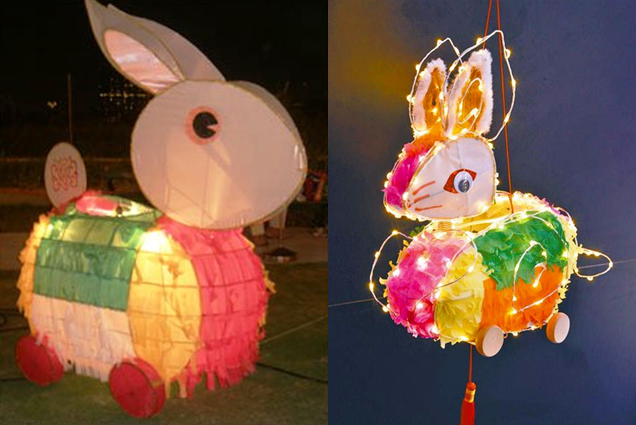 The Rabbit Lanterns - this has been a forever symbol of Mid Autumn lanterns in Hong Kong. When we were kids, we lit the rabbit with candles and we needed to handle with care as we were playing with real fire. Nowadays there are electronic ones which are more safe. Knowing that rabbit is the only friend of Chang'e in the moon, it is easy to understand why rabbit lantern is such an important symbol of the festival. Star Fruit Lanterns - there are several fruits more popular around the Mid Autumn Festival. Star Fruit is one of them. No wonder star-fruit-shape lanterns has also been one of the most traditional lanterns in Hong Kong. Traditional Lanterns - although electronic lanterns are widely popular in Hong Kong, but it can never replace the traditional way we play with lanterns. At home, we prefer to lighting lanterns with candles. After all, it's more fun although we had to take extra care to look after them. 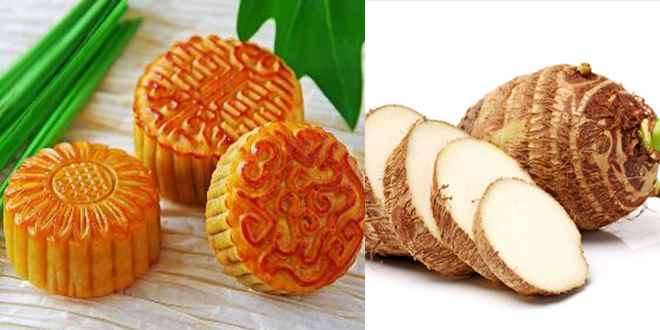 Moon Cake and Taro - what is the relation between moon cake and taro? 'Rich people eat moon cake, poor people eat taro'. What? Is there such a rule? Of course not, but in any society, there are rich people and poor people. Somehow most Cantonese in Hong Kong have heard about this: 有錢人家吃月餅, 冇錢人家吃芋頭. Mid Autumn Festival is a time when family members get together, enjoy food and celebrate. If you want to eat something good but cannot afford moon cake, then eat taro instead. This could be the poor people ridiculing themselves. Pomelo Lanterns and Peels - pomelo is one of the fruits exceptionally popular at Mid Autumn Festival. As it is large in size, it is good for family members to share. Apart from this, the pomelo peels are very useful. You see, the peels are so thick, hence we make lanterns and food out of it. Pomelo Lantern - it all depend on your skill. 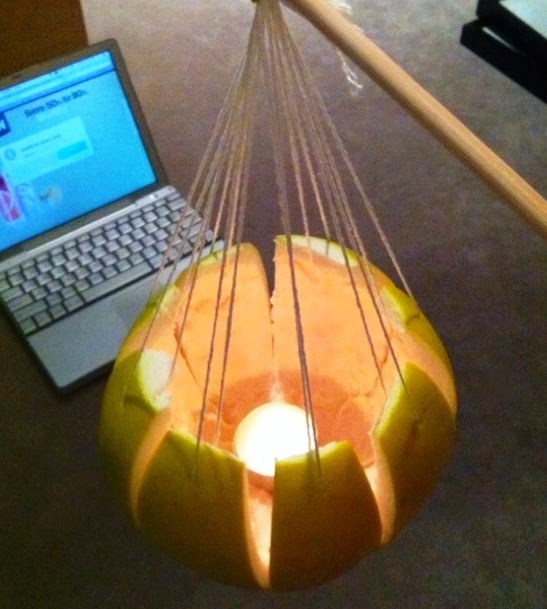 Some people can make very creative pomelo lanterns such as the one here. Pomelo Peels Dim Sum - Some people even turn pomelo peels into food. Today (the Moon Chasing Day), I specially order this pomelo peels over my dim sum lunch as part of the festival celebration. 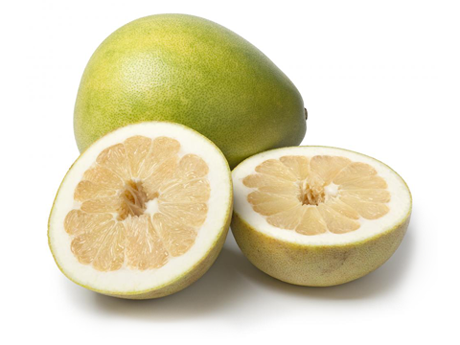 In fact, cooking of pomelo peels take a bit of time and effort. My mother used to cook it at home. We need to get rid of the zest first and then soak the thick peels until soft, add some seasoning before steaming. When we were young, we had great fun helping our mother in preparing the pomelo peels and making of pomelo lanterns. If you want to learn more about the Mid Autumn Festival legends, stories and history, there is an article at the International Business Times. Take a look and have fun. PS: Mid Autumn Festival usually occurs in September of western calendar. However 2014 Mid Autumn falls on September 8th which is the earliest in the recent 38 years. Why? We'll talk about this in my next post. In Hong Kong, people queue to buy all kinds of everything – houses, stocks, LV or Prada. Some people queue to buy these expensive or luxury items to speculate. What about queuing to buy cookies? When someone told me that people queue in Tsimshatsui to buy cookies and speculate for money, I was really unable to believe. This is the weirdest thing I ever heard. How much money people can make out of speculating cookies? When I first pass by this shop with a queue of about 100 people, it made me wanted to find out what they were queuing for. Cookies. In fact, these are not celebrity cookies or luxury brand cookies. I thought most of you may have never heard of this shop. It is just a high street bakery with only two branches (one in Tsimshatsui and one in Central) and a 5-page website having only couple of photos on each of those pages. Today when I pass by this shop again, it was midday around 34 degrees Celsius and the queue was as usual – LONG. Each time only around 10 customers were allowed to enter the shop to buy cookies. What made these people to queue under the sun to buy cookies? Certainly I’m not the only one curious about this weird scene. Every time I pass by this shop there were many people taking photographs, although one of the shop posters says ‘photography not allowed’. The legend did not stop there. The shop had little to no decoration, having only a stack of cookie boxes at the entrance along with several posters. One of the posters stated their rules of selling. There were only two core products – 4 or 8 Mix Butter Cookies in large or small boxes. Small box $65 (320 grams), large box $120 (640 grams). A cookie shop has a monthly turnover of close to HK$10 million is really amazing. Would you consider quitting your job and learn to make cookies? Hong Kong dominates the headlines of most media worldwide today. July 1, the date of the establishment of the HKSAR, has been an important date for demonstrators in Hong Kong since 1997. If you want to visit Hong Kong to see something which is REALLY UNIQUE here, July 1 is a good date. However you have to be SERIOUSLY responsible for your own safety. Look for some safe places or book a hotel along Hennessy Road and request a room overseeing the Hennessy Road. I would say this is the safest way. But mind you, you won’t be able to leave the hotel between 2 and 9pm, as there are road blocks for the demonstrators. How Many Protestors Are There? With these numbers, do you think you want to come to Hong Kong and see it yourself? The good thing is, it happens VERY PUNCTUALLY once every year on the same date July 1, regardless of weather or anything. Now let’s review some of the headlines from some major media. 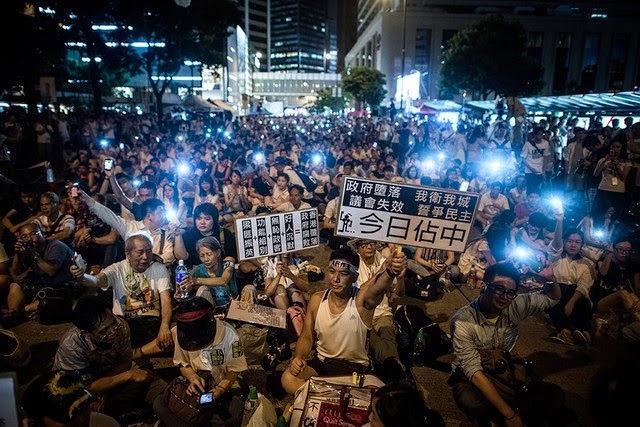 Hong Kong pro-democracy march attracts tens of thousands.Organisers expect 500,000-strong 1 July rally, and student activists plan 24-hour occupation of business district. 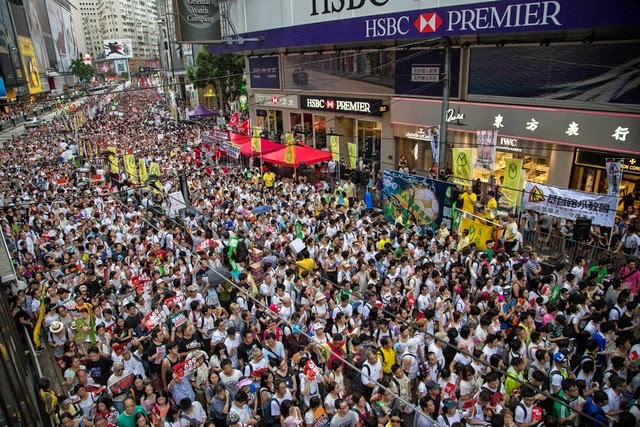 Huge Crowds Turn Out for Pro-Democracy March in Hong Kong, Defying Beijing. Massive Hong Kong Democracy Protest, Unwanted Party-Crashers. 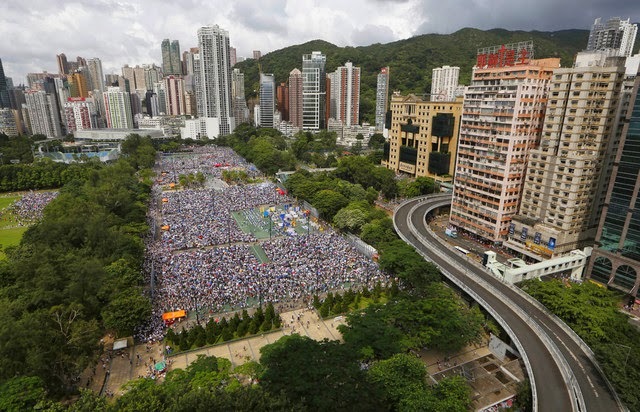 After almost 800,000 Occupy Central 'votes,' Hong Kong readies for massive protest. H.K. Police Clear Protesters After Decade’s Biggest Rally. South China Morning Post has this video article. Sit back and take one step further to get to know the history of Hong Kong demonstration. Highly recommended.